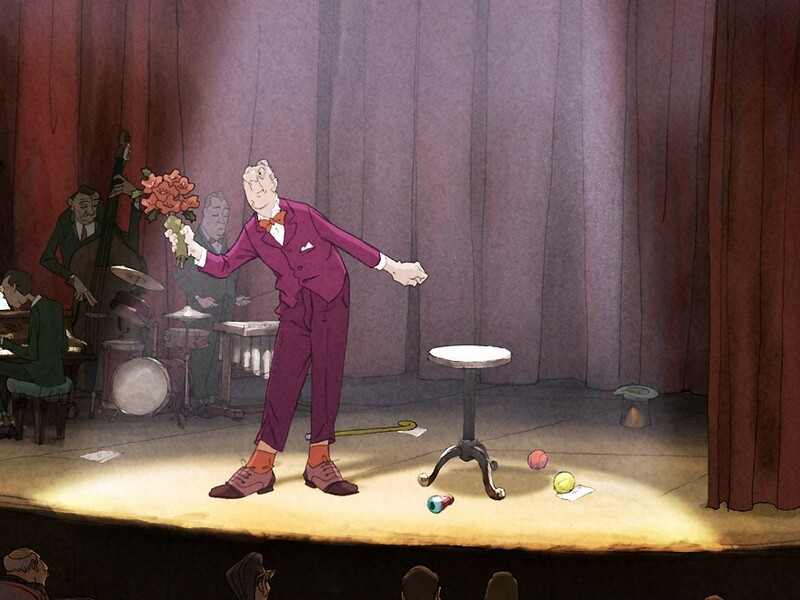 Sad and beautiful, The Illusionist is a requiem for wonder. By the late ‘50s in Europe, vaudevillians found themselves in a position similar to that of mountain gorillas. Assailed by modernity, the once flourishing magicians, clowns, trapeze artists and ventriloquists found themselves retreating into the remotest reaches. Scotland, in this case. That’s the picture painted by Sylvain Chomet’s melancholy new film, The Illusionist, anyway. It’s a requiem for simple, awkward, long-gone pleasures, and a tribute to the late Jacques Tati, who wrote a version of the screenplay and whose character and ethos were akin to those of Charlie Chaplin and Peter Sellers. An aging illusionist, Jacques Tatischeff, is forced by sparse attendance to leave Paris and wander around in search of an audience, first to London, then Edinburgh, then ultimately to some remote village only accessible by a ferry piloted by a drunk who wears a kilt and no underwear. Used to playing concert halls, in the village, Tatischeff plays a pub instead. His opening act is a light bulb. The town has just gotten electricity. The people cheer enthusiastically for Tatischeff. They cheer harder still for the installation of a jukebox, which is wheeled in after his performance. In town, he meets a young maid named Alice. Her clothes are threadbare and the soles of her shoes have come uncobbled. He buys her a new pair and, using sleight of hand, makes them appear out of nowhere. When Tatischeff leaves town, she follows him, becoming an ad hoc daughter for the increasingly lonely man. Wanting to keep her belief in magic alive in deeply consumerist Edinburgh, Tatischeff brings himself to financial ruin by buying her clothes and shoes and then sleight-of-hand-ing them into existence. The Illusionist has almost no dialogue. Much of the communication is non-verbal and performative. There’s a case being made here in defense of wonder, but the argument that Chomet (and, perhaps, Tati) wants to make is emotional, not logical. The Illusionist is best thought of as a cloak of almost woolen reminiscence, something to keep out the (often bitter) cold of modernity. I pulled this cloak around me as I walked home alone, reeling with the precipitous loss of wonder one experiences as one grows up — what begins to feel, after a fashion, like the complete drainage of magic from life. The longer I walked, though, the more my thoughts huddled themselves around the interactions of Tatischeff and Alice. Theirs is a friendship, that, while melancholy and probably hopeless, is still beautiful, and holds more wonder than a jukebox or a light bulb.